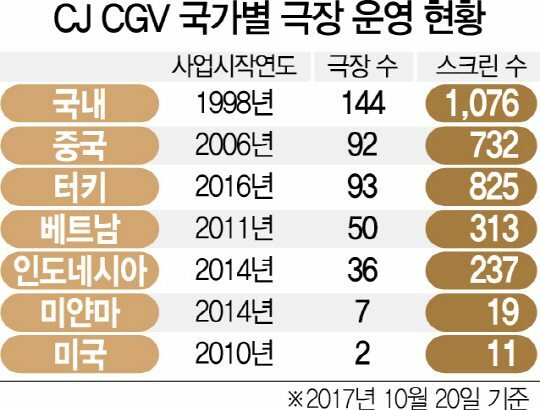 South Korean cinema major CJ CGV is set to stock market list its overseas cinema operation according to reports in Korean financial media. According to ChosunBiz CGV will begin with an initial public offering (IPO) of its Vietnamese subsidiary in 2018 before continuing with its other international operations ‘sequentially’. The move comes as AMC announces plans to IPO its European Odeon-NCG operation in 2018-2019. CGV has also recently been linked to a possible acquisition of Vue International. In addition to South Korea CJ CGV has major operations in Vietnam, China, Indonesia, Turkey, as well as smaller operations and Myanmar and the US. The company recently signed a JV deal to open and operate 33 cinemas in Moscow and eventually also the rest of Russia. After Vietnam, CGV is likely to focus on an IPO for its Chinese and/or Turkish operation, while Indonesia is likely to come third as CGV is only majority shareholder but does not control the operation outright. It is estimated that an IPO of CGV’s Vietnam operation could raise KRW 393.8 billion (USD $359 million). CGV is also busy expanding its operation in China following a thawing of relations between Korea and China. CGV plans to open a total of eight cinemas there before the end of this year. With plans to have 200 cinemas in China by 2020 CGV would achieve a six percent market share in the world’s largest cinema market by screen count. CGV is focused on overseas expansion as growth in its domestic market has been sluggish recently. Analyst Kim Min-jung sees the Korean market improving in Q4 as more attractive film titles open and an end to the temporary decrease in audience at CGV Yongsan Eye Park Mall due to refurbishment work. CGV’s Q4 profits are expected to increase by 44.6% compared to the same quarter last year, helped by the later Chuseok holiday this year. CJ CGV stated its ambition to be the largest cinema operator in the world with 10,000 screen by 2020 through acquisitions and organic growth. Though it was overtaken by Wanda/AMC in this ambition, its goal appear to remain and overseas IPO would give it funds to continue expanding aggressively.